Forty years ago, the OD-1 introduced the now-familiar concept of the overdrive pedal to world. During its development, BOSS engineers were looking for a more natural sound than the typical fuzz units of the day. To this end, they used an asymmetric clipping circuit that produces lots of even-order harmonics. The resulting design produces a warm, pleasing tone that’s similar to the natural breakup of a cranked-up tube amp, but with its own unique character and response. Today, the original OD-1 lives on in a slightly enhanced and more versatile form as the SD-1 Super OverDrive, a pedal that’s been in continuous production since 1981. With its expressive touch, subtle mid boost, and tight bass response, the OD-1 is well-loved by guitarists as a standalone pedal for all types of music styles, and as a front-end booster for amps and distortion stomps. The OD-1 reissue features a circuit with four op-amps, just like the earliest versions of the pedal. In addition, the diodes have been carefully selected to accurately reproduce the original OD-1 response characteristics. In 1977, phaser pedals had been around for a while, and there were a few popular competing models on the market. For the PH-1, BOSS engineers worked to create an improved design with better clarity and a deeper modulation range. In comparison to other four-stage phasers of the era, the PH-1 has a more natural and mild sound, with a richer low-end response. In addition, there’s a minimal level difference when the effect is turned on, thanks to its integrated output boost circuit. For the PH-1 reissue, the FETs for the four phase-shifting circuits have been carefully matched to make the response characteristics exactly like the original pedal. Furthermore, each individual preset resistor has been meticulously tuned by hand, replicating the same process that went into building the original PH-1. In the long history of BOSS compacts, the SP-1 stands out as one of the most unique pedals. Derived from an effect built into some early Roland guitar and bass amps, the SP-1 is basically a single-band parametric equalizer with a fixed level boost. The Spectrum knob allows you to sweep the center frequency from 500 Hz to 5 kHz, while the Balance knob adjusts the mix of the direct and effect sounds while keeping the overall level consistent. 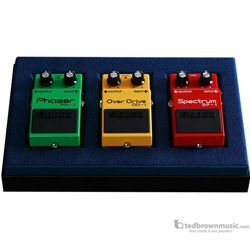 When used with guitar, the SP-1 produces a sound similar to a wah pedal set at a fixed position, but with a more focused boost at the center frequency. However, the SP-1 was most often used by bassists, who found it to be a great tool for cutting through the mix on stage. In either application, the Balance knob is very useful for filling out the sound with a bit of direct tone as needed. The SP-1 was produced in limited numbers until 1981. It’s probably the hardest vintage BOSS pedal to find on the used market, and commands the highest prices as a result. For the reissue, each individual preset resistor has been meticulously tuned by hand, ensuring fully accurate reproduction of the original SP-1 sound.